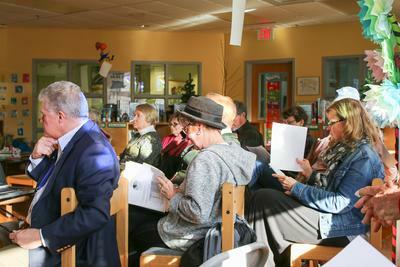 In an effort to inform Brooklin residents on the latest projections for the future of broadband in town, the Board of Selectmen and representatives from Consolidated Communications held a public information session on March 26. Selectman Bill Cohen gave a rundown of the work the selectmen and broadband committee have done over the last three years, to research various options for the town to effectively provide 100 percent of its residents with better, more efficient internet service. The most ideal way to make that happen would be to install fiber optics for each house in town, but the $2.1 million price tag seemed “a little too high” to do that work in the next few years. Instead, the selectmen have had several meetings and discussions with Consolidated Communications, the company who took over Fairpoint a couple years ago. The solution finally landed on, and the one that will be discussed at town meeting on April 6, was to enter into a contract with Consolidated to install infrastructure that will improve internet access to everybody in town. The town will ask voters to approve $105,000, to be matched by Consolidated, to begin work on the infrastructure improvements. That money will come from surplus and not have any effect on taxpayer dollars, according to Cohen. At the meeting, Consolidated Communications representative Jeff Nevins said that five major projects would be done in town over the course of the next several years, to install copper infrastructure with a “fiber backbone,” which will allow better internet to stream to each household in Brooklin. Some residents voiced concern that their customer service experience with Fairpoint was negative, and because of that they are leery about having to deal with the company that bought them out. Nevins assured those residents that the customers are the priority at Consolidated, and that through the next few years as projects are worked on, he, along with other representatives, will be “more than happy” to personally address any concerns that come up. Nevins also addressed resident comments about the possibility of service not improving on roads that are not along the main routes. He said that service should improve as infrastructure is added and built, and that if service does not improve once those projects are completed, calls to him or to customer service should quickly rectify those issues.